this collection poetry/film showcase: the write-up! …and what a first day it was! We flung open the doors at 10am and greeted the good people of Edinburgh as they came in to escape the swirling haar. Our DIY flags, posters and flyers drew a crowd made up of all sorts of people — some told us they’d had the date marked in their diary for weeks, while others just wandered in for a look and seemed to like what they saw! 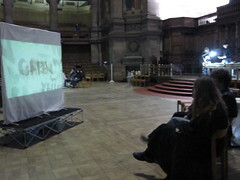 The film screenings were spread across four screens within the main hall space, with each screen housing around five or six films. These were subtly grouped by theme — warm, cold, stop-motion, palimpsest — and accompanied by their respective poems either on-screen or in DIY pamphlets for viewers to pick up and read. 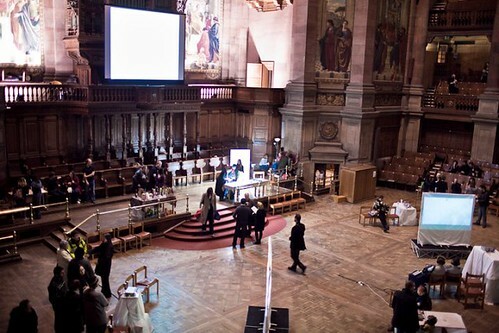 Sound engineer Simon Herron provided a spectacular non-stop city soundscape which played throughout the hall, and Glasgow-based experimental orchestra CRA:CC provided an improvised musical soundtrack in response to the films as they played out. Visitors were also able to congregate around our free press merchandise table: a source of books, pamphlets, magazines, journals, promotional materials and all manner of other poetry- and film-related paraphernalia, all of it completely free! Through the afternoon we saw a steady stream of visitors, all of whom responded positively to the installation and the project as a whole. Documenting their reactions to the films was almost as enjoyable as the films themselves — watch this space for photos, video and stop-motion footage of the event in due course! We were particularly happy to see people who’d never heard of this collection, but who left raving about it and asking how they could come on board and get involved! The evening kicked off at 6.30pm when we flung open the doors of the McEwan Hall, and were delighted to find an already-sizeable gaggle of keen poets, filmmakers and enthusiasts waiting on the doorstep. We quickly uncorked the first of many bottles of free wine and sat back to watch the influx of visitors. Once the crowd had gathered, I kicked off with a speech welcoming everyone to the event, giving a potted history of this collection and explaining what the evening had in store. Stefa then gave a brief round of thanks to all the wonderful people who’d helped make the event happen, and then without further ado, the party got under way! The first four poets to read were Dan Mussett (a late addition, stepping in to replace Morgan Downie who sadly couldn’t be with us), Russell Jones, Anita John and McGuire. Russell was spotted brandishing copies of his pamphlet, The Last Refuge (Forest Publications), which would suggest his reading went down very well with those who gravitated towards Poet Station #1. At Station #2 Dan Mussett gave a beautiful reading in spite of his late addition to the bill, and Anita John gathered a sizeable audience in the upper gallery at Station #4. Meanwhile at gallery Station #3 McGuire was a total triumph — even gathering a crowd in the main hall below! These four poets were followed by Tom Bristow, Juliet Wilson, Simon Jackson and Andrew C Ferguson respectively — Juliet brought along copies of her hot-off-the-press pamphlet ‘Unthinkable Skies’ (Calder Wood Press) and read a particularly lovely poem about a sycamore tree, among others. 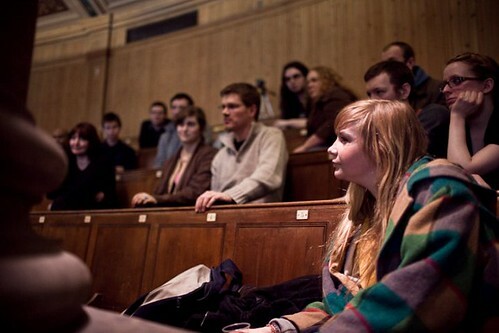 Simon Jackson was multi-tasking, as two of his films were also showing in the hall below, and Andrew and Tom both received rapturous rounds of applause from their respective audiences. The third sets were provided by Rob A Mackenzie, my good self (standing in for Aileen Ballantyne who also sadly couldn’t make it in the end), Christine de Luca and Chris Lindores. Rob and Christine both read excellently and Chris Lindores was a tour de force, gathering the largest crowd of the evening — and the most glowing feedback! — and shifting a fair few copies of his pamphlet, You Old Soak (Read This Press) over the course of the evening! The poetry was wrapped up by Andrew Philip, who read from his critically-acclaimed book The Ambulance Box (Salt); Jane McKie, whose film adaptation of La Plage (courtesy of Alastair Cook of DISSIMILAR) played in the background as she read; Hayley Shields, who entranced a small but attentive audience with her ghostly tales and accounts of Edinburgh’s darker side; and Mairi Sharratt, whose audience were asked to pick her set themselves, by shouting a series of numbers which each corresponded to a poem. All the poetry readings were accompanied by a continuous stream of beautiful, dark, inspiring and moving images courtesy of our many talented filmmakers. Adaptations by Helen Askew, Sean Gallen, Abhinaya Muralidharan, Alastair Cook, Ginnetta Correli, Diana Lindbjerg Jorgense, Dominique De Groen, Hans Peter, Heather Bowry, James Mildred and Francesca Sobanje, Laura Witz, Lewis Bennett, Rawan Mohammed, Rose Creasy, Simon Jackson, Stefanie Tan and ThatCollective all graced our projector screens as the evening progressed. 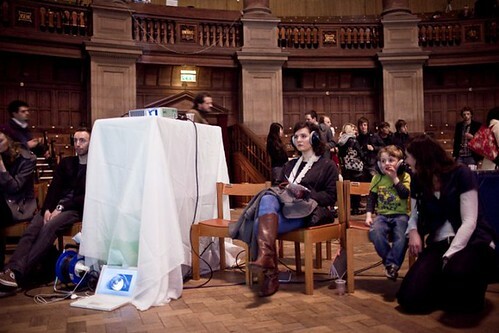 Although some of the films included audio (piped through headphones at each station), the McEwan Hall had its own soundtrack for the evening. This took the form of a mercurial city soundscape, put together by the super-talented Simon Herron of ThatCollective; as well as improvised music and ethereal sounds from the CRA:CC experimental ensemble. The evening rounded up just before 9pm, but the festivities continued well into the night at various alternative venues around the city! Altogether, the this collection team worked out that over 200 people had come along to be a part of our showcase, and so far we’ve received glowing feedback from poets, filmmakers, musicians and visitors alike. Thanks so much to everyone who came along, everyone who helped us organise, set up, take down, fund, promote or otherwise realise the event, and of course to all the brilliant artists who lent their creativity to us for the evening! this collection showcase photos by Tom Bishop and Marzieh Jarrahi. You are currently browsing the One Night Stanzas blog archives for March, 2010.